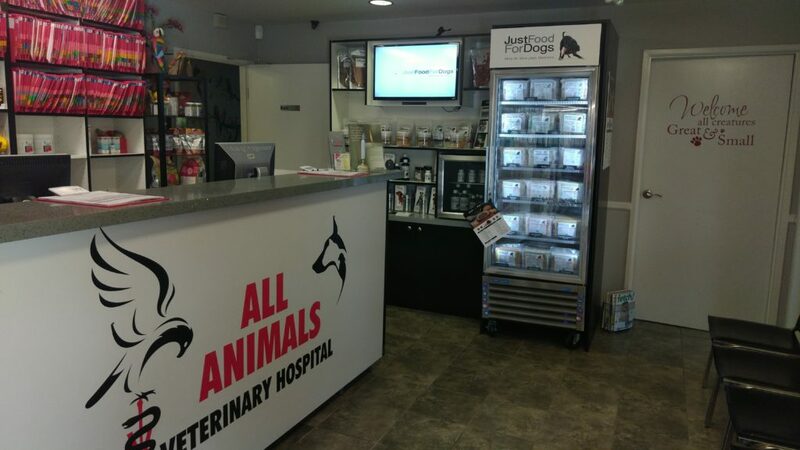 All Animals Veterinary Hospital in Calabasas now carries Just Food For Dogs products. We are honored to carry their six Daily Meals and eight Veterinary Support diets in convenient 14, 18 and 72 ounce packages. We carry all of their dog treats that are Baked, Bark and Dehydrated as well as their full line of supplements. Come visit us and pick up a treat for your dog. They will most surely believe they are eating human food. Venison & Squash (highest in novelty protein, squash is VERY nutritious for dogs, and best resembles the RAW diet approach since it is very high in protein and very low in carbs. These are just a few of each diet’s benefits. All of these diets may result in less body waste since dog is utilizing more digestible food! They also provide 8 unique veterinary diets for specific requirements that Dr. Molnar may prescribe depending on your pet’s health condition. The company provides custom formulations for more complex and specific needs working with veterinary nutritional specialists. Best of all, they offer all natural superior supplements that are of higher standards than most of our supplements that we take. Joint Care contains the NATURAL source of glucosamine (sulfate)which is proved to be effective vs. the synthetic hydrochloride compound. Joint care helps senior dogs with joint conditions and and prevents younger dogs to avoid joint complications later in life. Calm (one of our most favorite) is a very potent, non-narcotic, all natural capsule used for pets that have high anxiety or have fear of traveling to the veterinarian, fireworks, gardener, storms and need to relax. It all natural blend works by calming the nervous system by reducing stress in situations that usually cause tension. Olive Leaf Detox contains antioxidant and immune support properties. When used daily it allows the body to heal itself naturally. It is an anti-bacterial, anti-fungal, anti-viral and anti-cancer! Probiotic live should be a supplement that we believe all dogs should take in order to promote a healthy digestive tract preventing diarrhea, constipation, and allergies especially considering the diets our pets are ingesting. Omega Plus is also highly recommended as a part of your dog’s daily meal that supports healthy aging. It is a natural anti-inflammatory reducing pain and improving mobility. It helps control skin conditions and manage heart conditions. It is the best source of fish oil we have come across as the fish come from Iceland’s cleanest waters. All of the supplements are tested and reviewed by the veterinary board certified toxicologist and are made with 100% high grade, human quality ingredients. Feel free to ask us about this diet if you have any other questions. You are always welcome to stop by so that we can make a recommendation that best suits your dog. All clients are welcome, but so are your friends. You do not need to be a client to purchase this food as we want all dogs to live long and healthy.